People considering counseling careers may wonder what a gerontological counselor is. 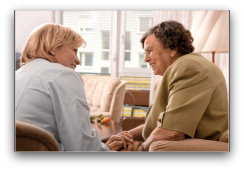 The term gerontology refers to the study of aging and gerontological counseling is the application of that study. The field is new and much of the information related to the career pertains to general counseling professions. Gerontological, or geriatric, counselors are professionals who deal with the problems associated with the aging process. As people age, physical and cognitive changes occur which can be challenging. In addition, many people from the Baby Boomer generation have reached, or will soon reach, their senior years. What is different about the Boomer population is that they are living longer and retiring later, according to the Career Profiles website. In addition to the classic challenges of physical ailments and impaired memories, these people deal with workplace issues and discrimination. The Boomers”are different in another way, too. There is less family support for older family members than there was formerly. This new set of problems demands a new kind of counselor to help find solutions. Careers in Psychology says gerontological counselors provide direct one-on-one patient contact, work with families to solve relationship issues, act as liaisons between the senior citizen and community or medical resources and make doctor’s appointments. They also may work as educators, giving programs about healthy aging and resources to groups of the elderly at places like senior centers and churches. In addition, the counselors may advocate for services to the elderly. In this capacity, they work closely with senior organizations like AARP because those groups have a stronger voice than one individual. There are entry-level positions available for people with Bachelor’s degrees and additional coursework in counseling, but to be licensed and certified you need at least a Master’s degree. If you enter the field as a psychologist you will need a Doctoral degree. Licensing requirements vary by state, but most require a Master’s degree in psychology and two years, or 3,000 hours of supervised clinical counseling work and the satisfactory completion of a licensing exam. In addition, practitioners can become certified, which is a voluntary process that leads to credentialing by the National Board for Certified Counselors. Because people are living longer and the birth rate is dropping, the population is rapidly aging. People are working longer into their senior years as well, prompting a new set of problems such as dealing with physical limitations in the workforce. Besides the increasing number of people who need the services, many counselors are leaving the profession as they age. Because of those considerations, the outlook for professions dealing with the elderly is bright. The projected job growth rate is 2i to 36 percent through 2016. Salary depends upon where you work. Those employed in residential facilities earned the least at a mean salary of $34,690. Counselors employed by the government earn $50,300. As the field emerges and people become used to getting the services, salaries will rise.